In 8-inch skillet, melt butter over medium-high heat. Cook bell pepper and broccoli in butter 1 to 2 minutes or until crisp-tender. Spray 1-quart casserole with cooking spray. Cut each roll into 1/2-inch cubes. 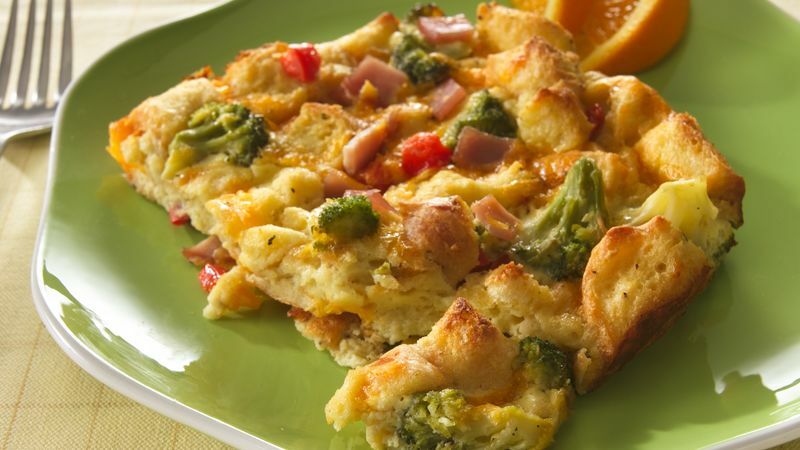 In large bowl, beat milk, eggs, mustard, onion salt and pepper with wire whisk; stir in broccoli mixture, bread cubes, bacon and cheese. Pour into casserole. Cover; refrigerate at least 4 hours but no longer than 8 hours. Heat oven to 350°F. Bake uncovered 45 to 50 minutes or until set. Cool 10 minutes before serving. Serve warm. Omit the Canadian bacon for a veggie version, and try pepper Jack cheese to spice it up.